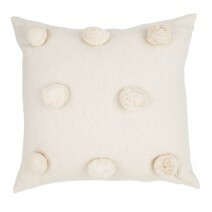 A large, off-white, feather filled scatter cushion covered in 8 giant cream pom poms on a washed cotton fabric – the ultimate Scandi touch for your sofa or armchair. Ethically Made: These textiles are made in their own factory in India by third generation cotton producers. Everything is ethically produced using traditional dying methods and innovative weaving and washing methods to give different textures. All employees are paid fair wages and work in ideal working conditions with no child employment. Supporting the lives of orphans and local communities is at the very heart of the company’s core values. They work with organizations that enhance livelihood, income generation and micro-enterprise development. All cushions come with non-live plucked feather pads, meaning that all the feathers used are a by-product of the meat industry, reducing wastage.